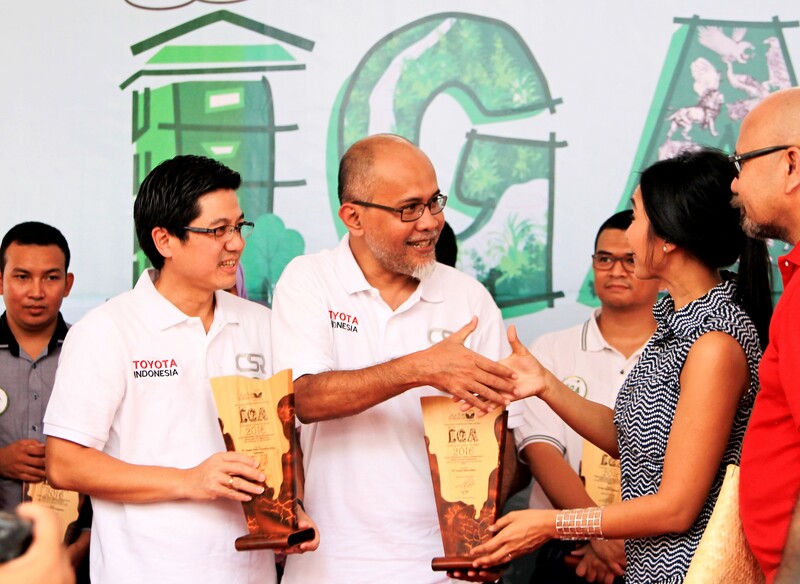 Jakarta - Toyota Motor Manufacturing Indonesia received the award "The Best Indonesia Green Award 2016" for CSR programs TMMIN that always support the maintenance and preservation of the environment.The Award for "Indonesia Green Awards (IGA) 2016" is organized by The La Tofi School of CSR in cooperation with the Ministry of Forestry Environment and the Ministry of Industry, it was held at Taman Tebet, Jakarta, Saturday (21/05). Indonesia Green Award 2016 is the 7th year event that organized by La Tofi School of CSR to commemorate Earth Day on April 22. this 2016, it was the first year for TMMIN on receiving the IGA award and straightly won six awards categories. The 6 categories that achieved are the "Rescuing Water Resources Category" for the conservation of water through the rainwater media on Karawang Plant no. 1 and 2, "Save Energy and Use of New and Renewable Energy Category" for Windmill and Solar Cell, "Developing Biodiversity Category" for Toyota Forest, "Category for pollution Prevention" program to reduce pollution by interacting (babarengan), "Develop Integrated Waste Processing Category and Fire Land Prevention and Response Category" for traffic safety. The award for "The Best Indonesia Green Awards 2016" was submitted by the Chairman The La Tofi School of CSR La Tofi and the Director General of Social Forestry and Environmental Partnership Forestry Ministry of Environment - which is also the Chairman of the Jury on IGA 2016 - Hadi Daryanto to the Vice President of TMMIN Mr. Warih AT. TMMIN expect to the appreciation of the La Tofi School of CSR to be able to continue to inspire Indonesia in improving environmental quality.